Remember when Oprah lost all that weight and everyone was like “yeah I could do it too, if I had a personal trainer and a chef”? And you know when you look at pinterest and think “yeah I could create a pinterest worthy party too, if I had a party planner and a huge budget”. Well you can do it yourself and on a budget,…even a tight budget. We’re 4 Months into our A Year of Feasting Challenge, and four parties into the challenge. We are already feeling like this was a great challenge to take on. We’ve connected with some old friends, and new ones, and so enjoyed seeing our friends more. It might seem so obvious, but it’s been a great way to get through the winter, planning a party every month, and spending time with people we love. And it’s not too late for you to join in too -once a month, or just a few parties over the year, what ever works for you and your family. This post is one I’ve been working on for a while, and thought this was the perfect time to share it with you. Just in case some of you were thinking you couldn’t join in on the challenge because you can’t afford it. It can be expensive to entertain, but I do have some tips that will help make it a little less expensive, and hopefully more do-able for you. These tips are especially helpful for Birthday Parties -and this month we have two at our house. For a birthday, I want things to be extra special, I want to think of a theme that suits the birthday girl or boy, get baking and decorating and crafting and pull out all my little tricks to make it extra special. Every party I throw isn’t “pinterest worthy” -and it doesn’t have to be, but birthdays are a great excuse to really get your party on! Great parties, especially ones done on a budget take time. In fact, one of the main reasons I ever end-up spending more than I wanted to is because I’m running out of time. It takes time to craft it, find it, bake it, and create it. If you don’t mind a few nights in front of the tv making decorations, or an afternoon of baking before the party, or keeping your eyes open over the next month while your out shopping, or ordering things on-line weeks before the party, you can stay on budget. It takes time to find and create all the perfect little details, but those are the things that take a party from ordinary to being pinterest worthy! Give yourself time to plan ahead. 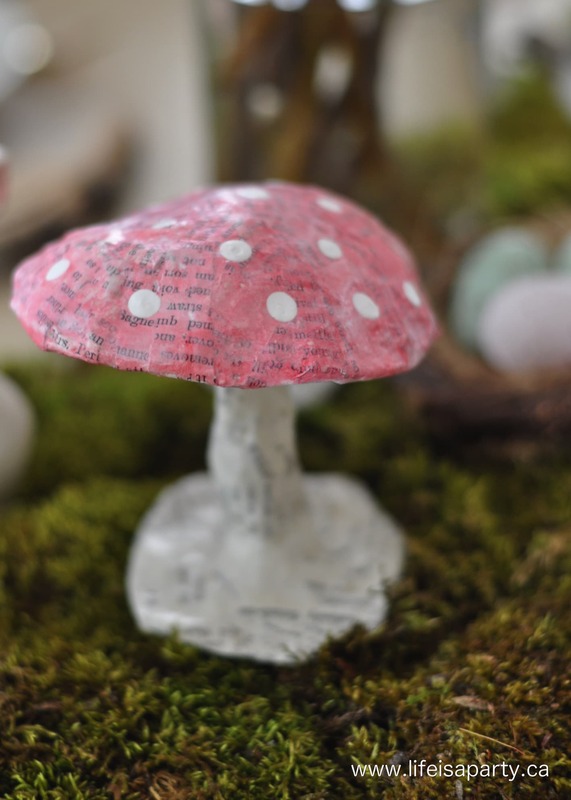 These paper mache mushrooms for our Spring Woodland Easter Brunch cost next to nothing to make -tinfoil, newspaper, flour, and paint and lots of time. If you’re going to get crafty to stay on budget, you’ve got to give yourself enough time to actually do the crafts. 2. Choose a Theme and Colour Scheme. 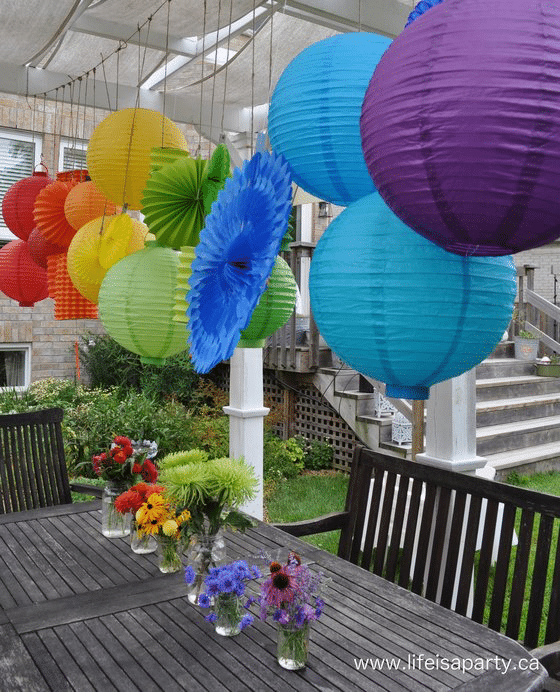 Rainbow party paper lanterns and flowers for the paint party. 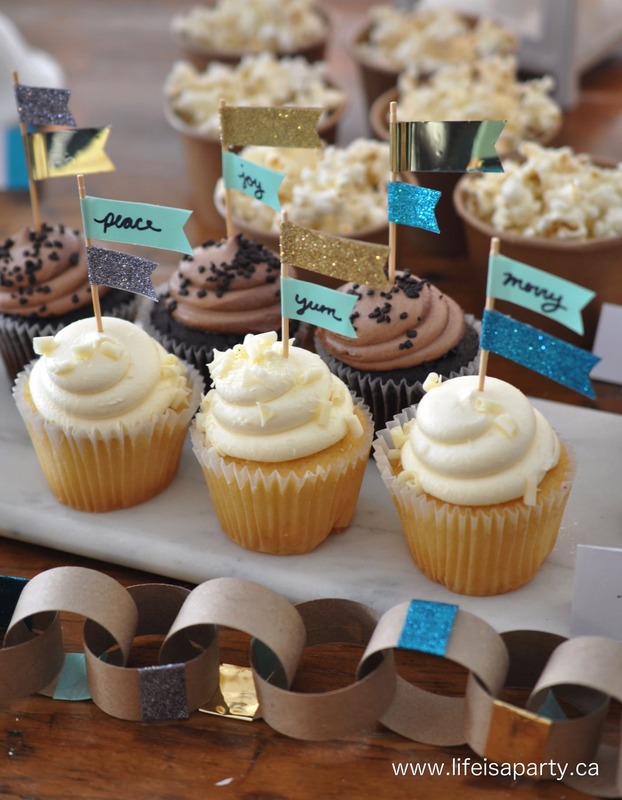 A theme will help you create a party with real impact and help you narrow down your choices for all the little details. We’ve all had that feeling of not knowing where to begin, a choosing a theme will help you find the starting place. The kind of party your having will help you choose a good theme. A birthday party might have a theme based on the guest of honours interests, or favourite things. A baby shower theme might be inspired by gender, or mom and dad’s interests. A dinner party might be based on a type of food, like a night in Paris or a Fiesta. A summer bbq might be as simple as choosing a fun colour as theme. There as many possibilities as you can think of, and truly anything can make a good theme for a party. 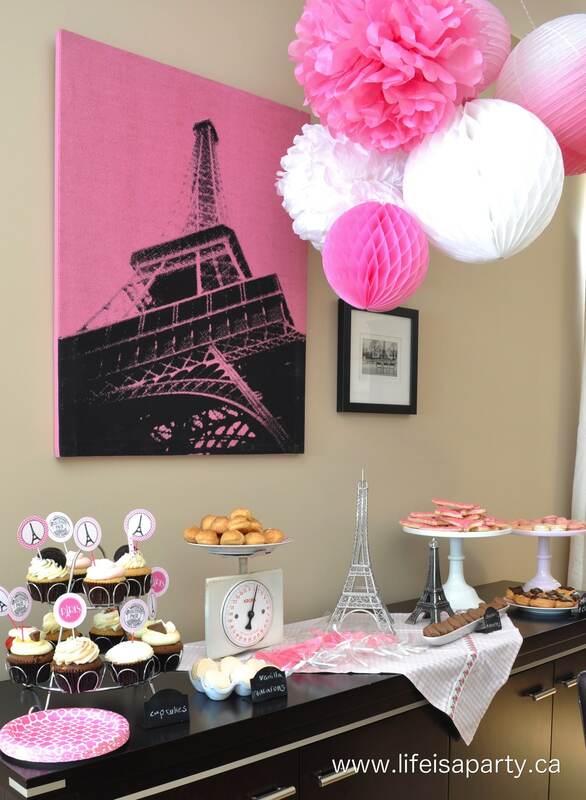 The Pink Paris dessert table was so much fun to put together. Once the theme is picked narrow it down to a colour scheme too. This will help you select all the rest of the things for the party. It could be as simple as a one colour or a mix. It might come right out of your party theme, like a brown and white for a chocolate party, or it might be the theme of the whole party, like an orange party. 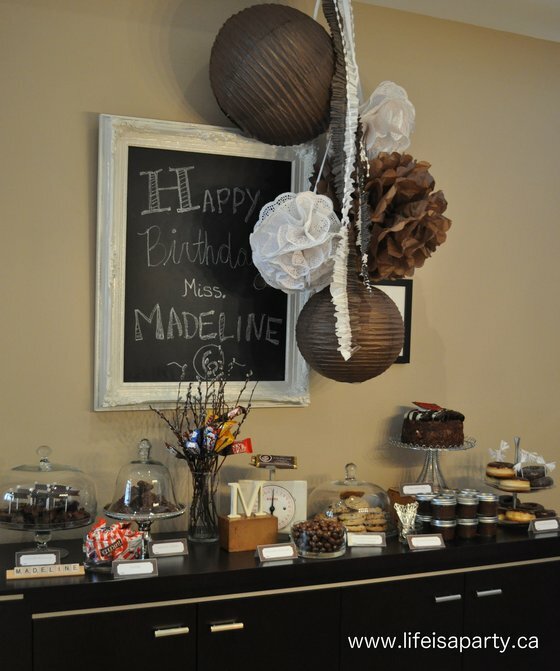 For the Chocolate party, everything was brown, white, and chocolate-y! Sometimes it’s fun to theme the food for a party. A tea party, Fiesta, or pizza party have obvious menus implied. But, other fun things might come to mind depending on your theme. 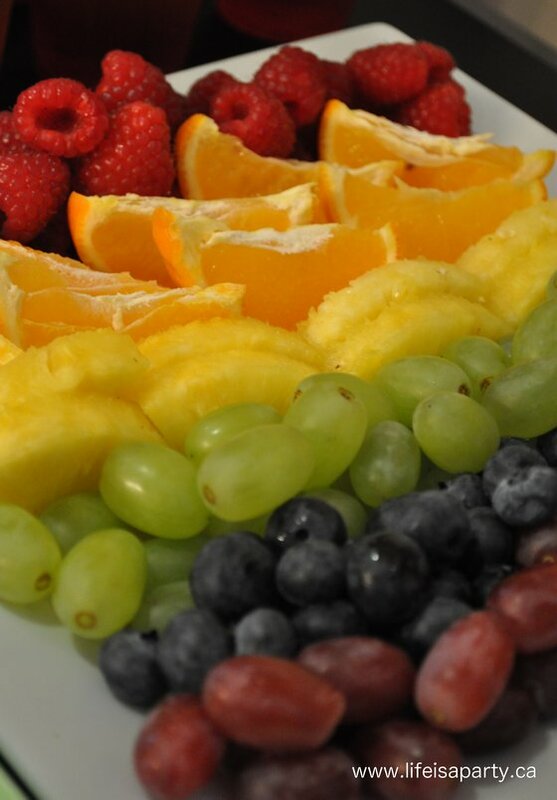 At a rainbow party a rainbow fruit party is a fun touch. At a teddy bear party, teddy bear shaped buns are amazing. So, put on your thinking cap and see what you can come up with related to your theme. 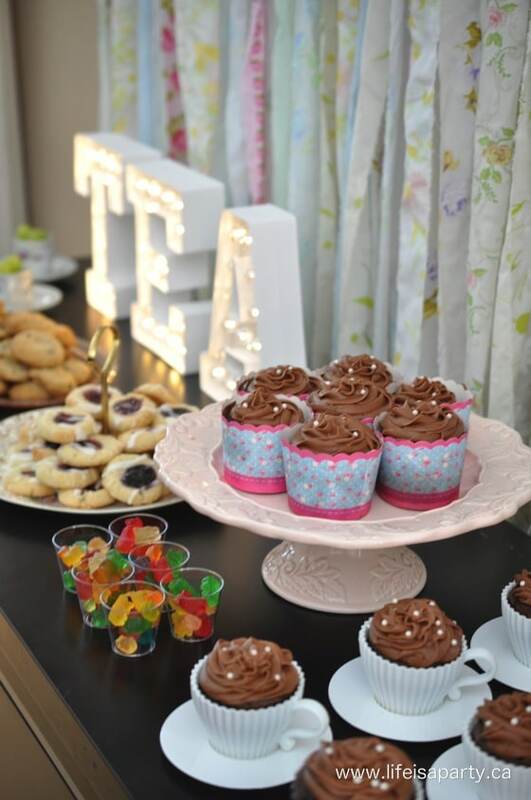 The Teddy Bear Tea Party, with the sweetest tea cup cupcakes, and gummy bears! Depending on when your party is will make a big difference to your menu. Is it breakfast, brunch, lunch, dinner, snacks, dessert? Sometimes this can help with budget too -an amazing breakfast will likely be cheaper to make than a dinner. 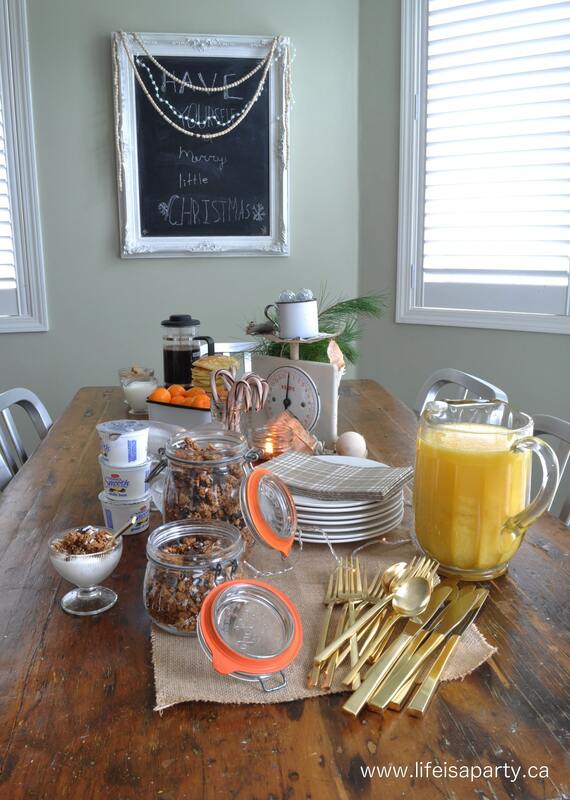 A pretty breakfast get together with coffee, pancakes, fruit, home made granola and smooth cottage cheese parfaits. I’m convinced that even on a budget you can have great food. 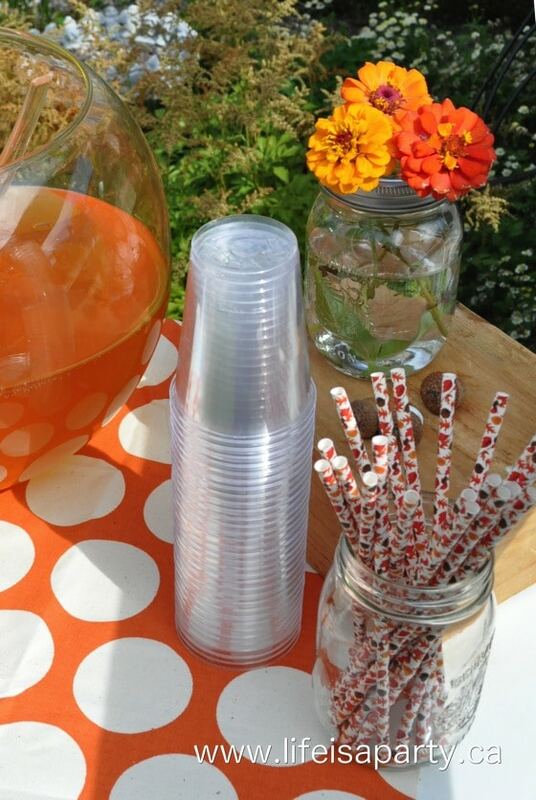 A few budget choices that your guests won’t even notice are try serving punch instead of cans of fancy pop. Fall punch made from peach juice and ginger ale. Think about the cost of your protein and look for sale items. The meat is always the most expensive part of the meal. If you’re trying to save money, don’t plan on steak, instead think about what’s on sale. Purchase things in advance and freeze, or take advantage of price matching and find it on sale somewhere. 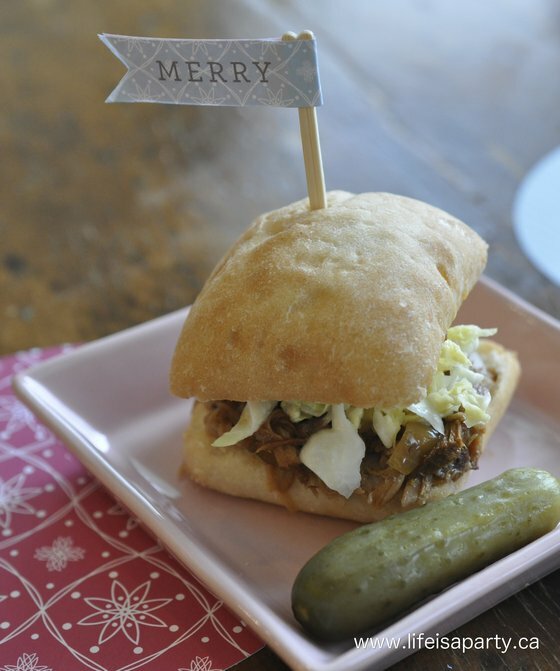 Pork was on sale, and made great mini pulled pork sliders for a Christmas party. Think about cost effective items. For example do a veggie and dip tray instead of a cheese tray -cheese can be expensive. Also, make your fruit, and veggie trays, and salads yourself, it will be way cheaper than buying already made ones. Also, plan on baking treats, and the cake yourself. If it’s too much prep for you the day before, make some a week before and freeze it. Don’t be afraid to ask close friends for family to help out by bringing something too. Especially a family favourite is a great way for Grandma to feel like she’s involved in a family birthday and help you out too. Rainbow fruit tray from the paint party, that I made myself instead of buying all ready prepared. Let what’s in season guide you when your planning your menu. You’ll get what’s freshest, and what’s cheapest. Win. win. 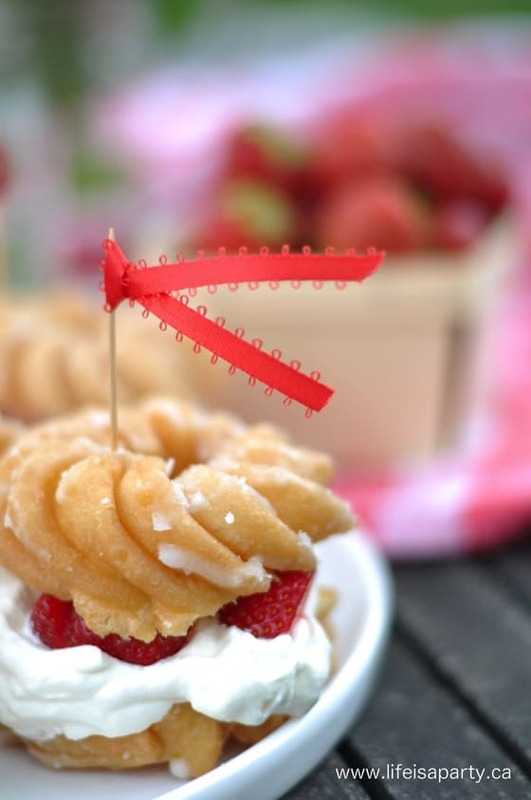 We picked our own strawberries and made these delicious donut strawberry shortcakes for a party. It’s amazing what you can do with some paper, and a glue gun! Find some pretty scrapbook paper in your colour scheme and break out your scissors. 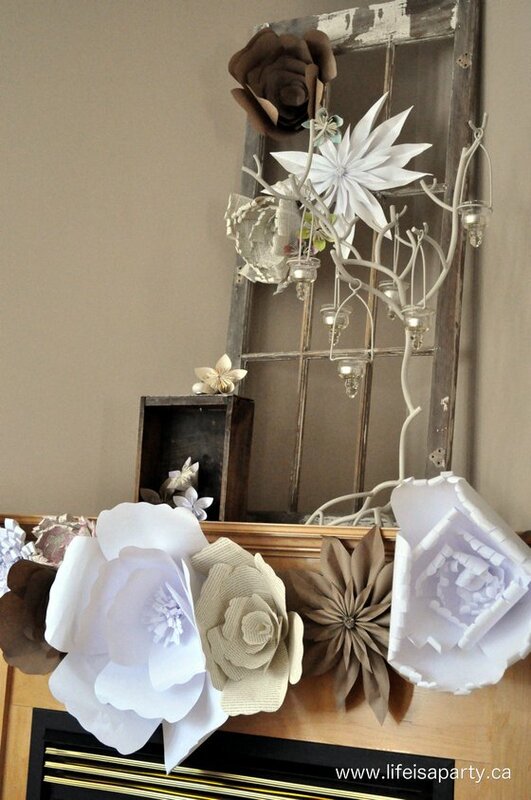 Hand made paper flowers, made from white paper, kraft paper, and old book pages. 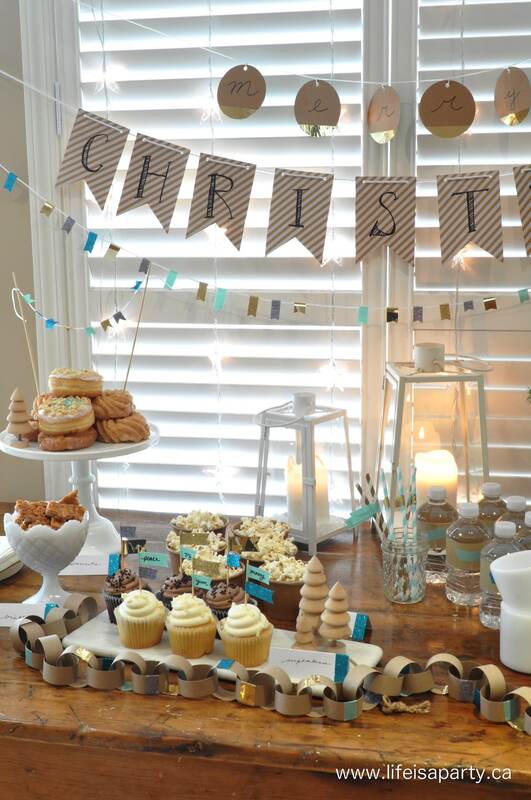 We used washi tape to make banners, cupcake pics, and paper chains for this Christmas party. The list is really endless and you certainly don’t need to make everything on this list, it’s just to get you thinking. Create your own, use printables from on-line, or add custom details to store bought party supplies. Start with your theme and colour scheme and go from there. 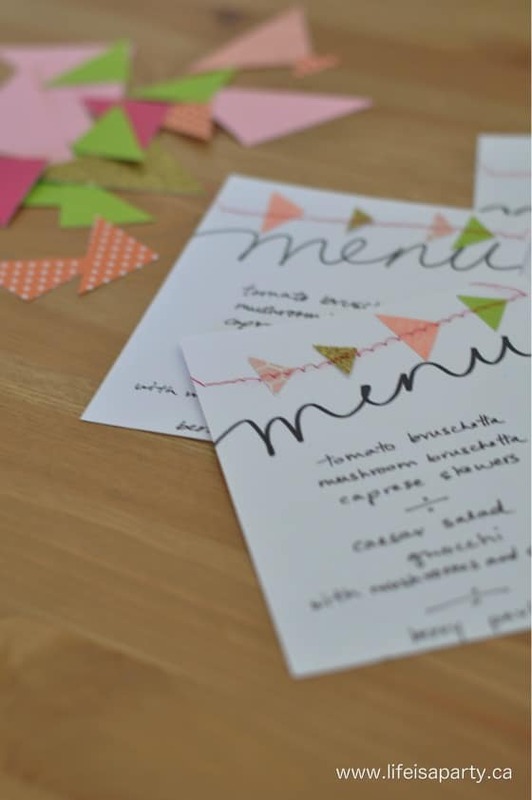 Hand made menus for a dinner party. The guests loved them so much they took them home for a keepsake. One great way to stay on budget is to invest in good party basics. If you like to entertain then an investment in things like neutral coloured platters, serving pieces and cloth napkins will pay off in the long run. I remember the first dinner party my husband and I hosted, we were still just dating. We invested in 12 white cloth napkins, and 12 nice wine glasses. Some of the other pieces for that party were a bit of a hodge-podge, but those couple neutral sets are still going strong almost 15 years later! 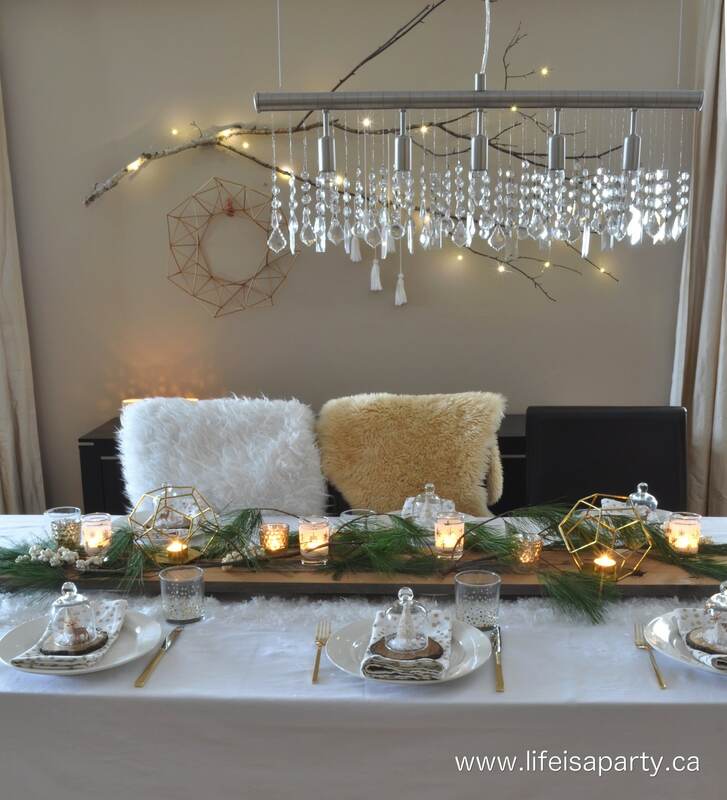 For this pretty Christmas table I used lots of good basics like a white table cloth, white plates, and the pretty cloches -all bought in sets of twelve when possible. Another tip of mine, if your love to entertain is to never buy fewer than 12 of anything. When you’re young, you think 6 is a big set, by the time you have a family your perspective shifts a little. My family is four, my friends are mostly that size too, so with just one additional family we’re already at 8. See what I mean? And lastly, keep it mostly neutral. A few colourful pieces will add punch, but for the most party white platters, clear glass serving pieces, or plain metal trays all work together. Lots of basic white serving pieces used here, that go with everything, and can be pulled out time and time again. 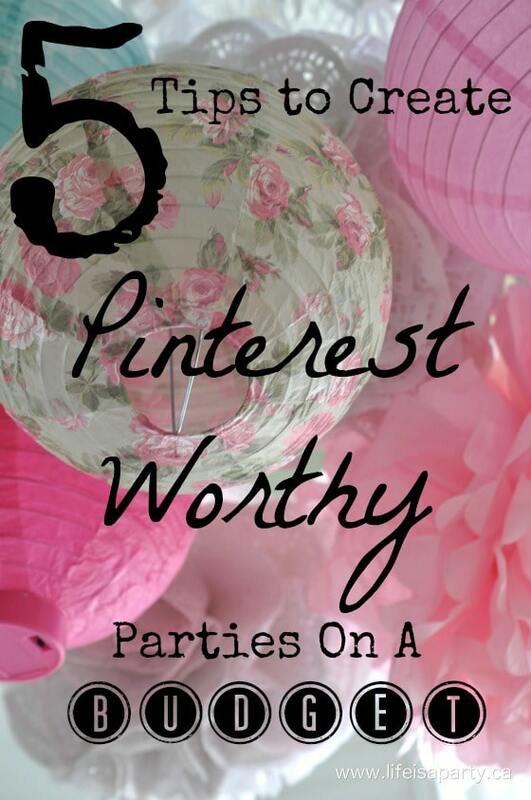 These are my 5 best tips for creating a truly pinterest-worthy party on a budget. If you follow this advice of giving yourself lots of time, choosing a theme and colour scheme, choosing your menu, making your decorations, and investing in good party neutrals you have all the things you need to create something amazing and memorable without breaking the bank. With great times of celebrating ahead, life really is a party! Where can I get your printable passport for Paris party for child, etc? Hi Catharine, I purchased the passports from an etsy shop.